It didn’t take long for the magick to really kick up when Martin got back home from N Ireland. Like he arrived December 2nd and this incident happened the next night. I guess the Elementals were welcoming home one of their own. Martin and I had doors and windows open, the wind blew the back door semi closed. It’s been raining but that had subsided, so I open the door and walk back in and I hear a splash in my pool like a fish was jumping, like a decent size fish, but the water is still. Martin hears it too. We figure it might have just been water falling into the pool from the screen. But for it to be so loud and there not to be wave? We thought that was odd, even for us. Soon after we hear it AGAIN! Now it’s really getting our attention because it literally sounds like a mermaid or dolphin splashing in our pool! But again the water is still, absolutely NO movement in the water! While out on the patio, waiting to see if any more is going to happen, Martin returns a call from our friend who works with dolphins. While on the phone we hear it yet again. Martin yells for me and I yell back that I heard it. After the 2nd time it gets Martin attention so he’s looking at the pool, but no ripples of water, no water falling from the screen or anything! AND the splashes were LOUD!! Like a dolphin jumping, or mermaid hitting her tail on the water. The 3rd time we hear it Martin said he saw a fin shadow, but still no movement in the water! Five times we heard splashes in our pool but with NO water movement! BUT Martin did see things happening! We must have some exciting stuff coming up! Just an average night in the magickal Jordan household! A song Martin wrote for our friends who work with the dolphins. Looking forward to hearing what this is all about! Martin wrote pages of messages early this morning from the water spirits that visited last night. Ahhhhh things feeling back to (para) normal again! Martin’s Note: I believe that this the main message for me was to pay attention to the elementals, the water ones in particular. They are in the physical world in the form of Dolphins. 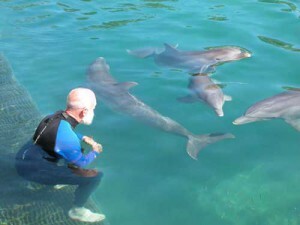 The Dolphins actually have the ability to communicate with us in psychic ways. In this particular case I got a call from my friend that does dolphin research right at the same time. This also let me know that this friend and I have business to get to, we just don’t know what it is yet, and we both have come through our own traumas in this last year and know we have been saved for a purpose. We just don’t know what that is yet.